New York school teacher Charlotte Lambert is practical and predictable, and never allows life to veer off course. Until she comes to New Mexico. During one summer in Agua Dulce, a village haunted by a phantom herd of wild horses, and where ravens embody the spirits of ancestors, Charlotte’s world is upended as she unearths the details of her mother’s forbidden love affair, chilling murder, and courageous last act of redemption. Pursued by a madman hell-bent on killing her, Charlotte finds shelter, romance, and her own misplaced soul at the desert camp of a surprisingly sophisticated cowboy, and learns how love in its myriad forms is the only path to lasting salvation. 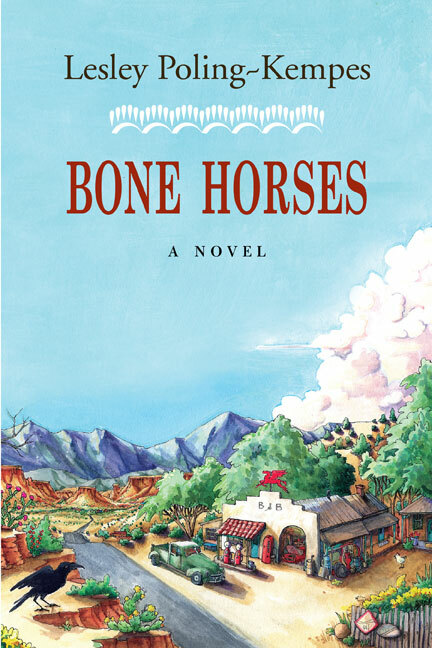 In the exquisite novel, Bone Horses, Lesley Poling-Kempes grandly creates the landscape of New Mexico as a living character—vital, enduring and full of magic. As the geography of the American Southwest comes alive on the pages, the geography of the heart is revealed to be far more than muscle and bone. This is a story of what truly knits us together—family, history, enduring friendships—served up in luminous language and unforgettable story-telling. Bone Horses unfolds like a desert sunrise—lifting from the Southwest landscape with a well-crafted storyline that keeps the reader on the path tracking romance, family legends, unsolved murders, buried bones, and elusive wild horses. I found myself drawn into the colorful and mysterious world of Agua Dulce much like I’m drawn into the vibrant and deceptively simple landscape of a Georgia O’Keeffe painting. And, like Bone Horses’ heroine Charlotte, I found myself not wanting to leave. Lesley Poling-Kempes is deservedly known for her beautiful nonfiction books about Abiquiu and the Ghost Ranch area of northern New Mexico. Her second novel, Bone Horses, can only enhance her reputation. Her love of the land and its wild spirit shines through this tragic story with redemption at the end. It is a fine mystery, with complex twists and turns. Bone Horses is also a paean to the land and especially to its rare wild horses who symbolize all that is wonderful about our high desert country and all that needs our love and protection. Lesley Poling-Kempes is the award-winning author of five books about the American Southwest, including The Harvey Girls: Women Who Opened the West; Valley of Shining Stone: The Story of Abiquiu; and Ghost Ranch. Her work has won the Zia Award for Excellence, and her first novel, Canyon of Remembering, was a Western Writers of America Spur Award finalist. She lives in Abiquiu, New Mexico.